Green heron | Florida Hikes! 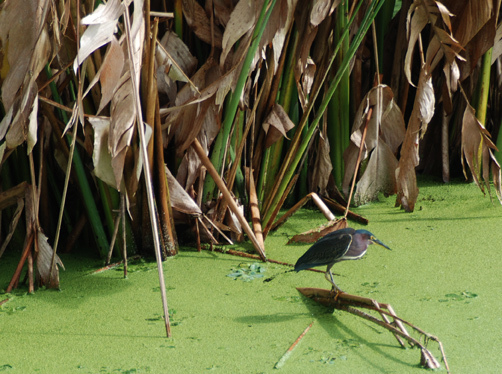 Green herons make us think of the “Angry Birds” craze that washed over the world a decade or more ago. Except when they’re moving quickly to nab a fish or frog, they sit with their neck all scrunched up so they almost don’t look like a heron. They tend to be solitary and fuss at anyone or anything moving into their territory. They look very much like the American Bittern from a distance. But the way they hold their neck and the iridescent green of the feathers on their backs help make them easy to identify when you view them more closely.